Preheat your oven to 390 - 400 degrees. Wash the sand off your beets & cut off the tops (eat them, too). You can leave the tails on. 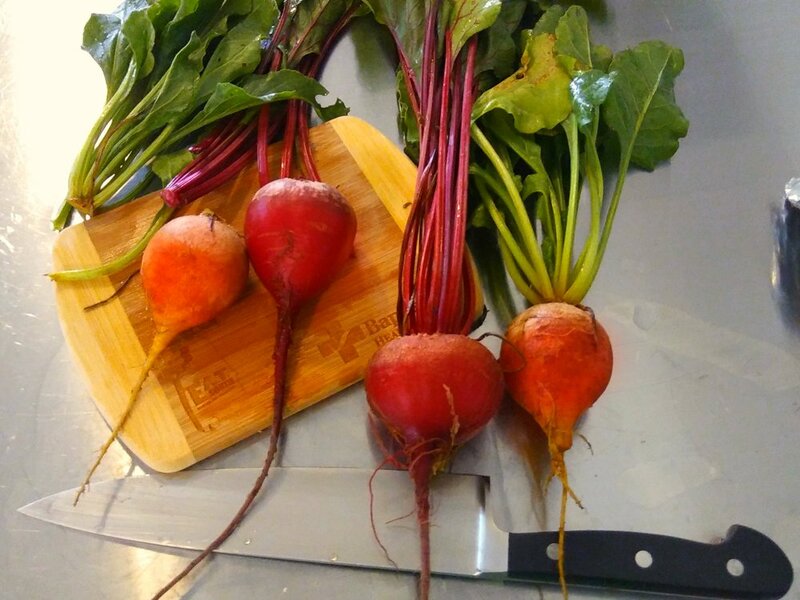 Place in oven on a pan or tray so beet juice doesn't leak on your oven. Cook for 30 - 40 min. depending on the size of the beets. Open foil and let beets cool enough to handle them. Rub the beet skin off with your fingers. Slice and use in salads or in these tasty recipes. Beet Salad - just toss your cooked beets with some oil, vinegar, salt and pepper, and they're really good. You can add toasted walnuts, pecans, blue cheese, goat cheese. The Food Network has also compiled a whole list of beet salad recipes if you're looking for a little more inspiration.